The Educational Foundation of Neenah will honor 16 Neenah Joint School District educators in its 2018-19 "Rocketing Ahead: Celebration of Education" Teaching Awards. Eight individuals and one team of staff members have been recognized as the Neenah Joint School District&apos;s Employees of the Year for the 2018-19 school year. The Neenah Joint School District received the prestigious Secretary of Defense Employer Support Freedom Award for its support of employees serving the nation in a military reserve capacity. The award is the highest recognition given by the U.S. Government to employers for their outstanding support of employees serving in the Guard and Reserve. Dr. Deborah Watry has been selected for a one-year appointment to the Neenah Joint School District Board of Education. A team of three Shattuck Middle School students recently placed fourth at the Wisconsin State VEX IQ Robotics Tournament and became the first middle school group from Neenah to qualify for the VEX Robotics World Championship April 28-30 in Louisville, Ky.
Spring Road Elementary and Lakeview Elementary Schools in Neenah have been recognized for their efforts in helping students walk to school with awards by the East Central Wisconsin Safe Routes to School Program. Students from Shattuck and Horace Mann Middle Schools will present five shows of Rodgers and Hammerstein&apos;s Getting to Know Cinderella March 14-17 in Pickard Auditorium at Neenah High School. Andrew Thorson made an unusual career move four years ago and it has paid big dividends for the Neenah Joint School District. Neenah High School athletes captured a WIAA state championship in girls hockey and a runner-up finish in boys hockey Feb. 28-March 2 at the state tournament in Madison. Applications to fill an open seat for a one-year appointment to the Neenah Joint School District Board of Education will be accepted until March 7. Five students from Alliance Charter School drafted a proclamation that was approved by Governor Tony Evers declaring Feb. 24-March 2 Montessori Education Week in Wisconsin. The Neenah Joint School District Board of Education will hold an upcoming meeting on Feb. 28 to determine the timeline for filling a current vacancy on the nine-member Board. Two Neenah elementary schools were among 10 schools honored statewide with "Program of Promise" awards by the Wisconsin School Counselor Association (WSCA). Students from the Neenah High School Choirs and Orchestras will be presenting the first seven movements of Mozart&apos;s Requiem on Tuesday, February 19 at 7:30 p.m. in Pickard Auditorium. Prospective Neenah Joint School District four-year-old kindergarten families are invited to open house events to visit the classrooms before the enrollment period begins. The film "SCREENAGERS: Growing Up In The Digital Age," will be hosted by the Neenah Joint School District Technology Department on Feb. 25 at 6:30 p.m. in Pickard Auditorium at Neenah High School. Visitors to all Neenah Joint School District buildings will be required to present identification during the school day beginning on January 22. Neenah Joint School District residents will be asked to support a $129.5 million referendum for facilities improvements and a new middle school on April 2. Neenah High School&apos;s Arete Academy has been selected as the winner of Miron Construction&apos;s "Be Green in &apos;18" video contest. The Neenah Joint School District has received an $88,600 grant to develop special education teachers for the next two years. The Neenah Board of Education will vote on a resolution to seek $129.58 million in facilities upgrades in a community referendum. Neenah High School&apos;s equestrian team won its first Wisconsin Interscholastic Horsemanship Association state championship this fall in Madison. Seven Neenah schools significantly exceeded expectations and the District landed in the "exceeds expectations" category for the third straight year in 2017-18 school report card data released today by the Wisconsin Department of Public Instruction. One of Neenah High School&apos;s most uplifting annual events takes place on Thursday, Nov. 15, 2018 when the Special Olympics basketball team takes center stage with the varsity boys basketball team. Three grants have been awarded to Neenah Joint School District staff members through the Vera and Carol Tipler Awards. Neenah High School will recognize local veterans with a Veterans Day ceremony in Pickard Auditorium on Friday, Nov. 9, 2018. The event is open to the public and begins at 1:30 p.m. with doors opening at 1 p.m.
Three quarters of Neenah Joint School District residents indicated the District should pursue a referendum in a recent community survey. Nominations for the Neenah Joint School District Hall of Fame are being accepted through Nov. 30. Neenah High School inducted 58 students into its National Honor Society chapter during a ceremony on October 24. Ten schools from the Neenah Joint School District were among the 49 winners of the Wisconsin Department of Public Instruction&apos;s 2018 Wisconsin School Health Awards. Neenah High School&apos;s 10th annual Helping Hands Craft Fair is set for Sat., Nov. 3, 2018 from 9 a.m. to 3 p.m. in the Ron Einerson Fieldhouse. Neenah captured its third WIAA state boys cross country title and first since 2001 with four runners among the top 30 finishers to edge defending champion Middleton by nine points on Saturday in Wisconsin Rapids. Nine Neenah High School students were chosen to participate in the annual Wisconsin State Music Association High School State Honors Project in Madison. Neenah Joint School District residents are reminded of an upcoming special Board of Education meeting on Tuesday, October 30 to review the results of the recent community facilities survey. Three Neenah High School seniors have been named semifinalists for the prestigious National Merit Scholarship Program. A total of 13 students from various grade levels were honored for their creative writing in the annual Neenah Public Library Proces Poetry Prize Contest. After earning celebrity status on FOX&apos;s MasterChef this past season, Neenah High School alum Emily Hallock will return to her alma mater for a special community event on Wednesday, November 7. The Neenah Joint School District has received a $379,852 grant from the Wisconsin Department of Justice to support school safety efforts and mental health training. Neenah Students Offered World Travel Opportunities Through "Neenah Without Borders"
Students in Neenah will have the opportunity to explore other cultures and travel abroad through a unique school program called "Neenah Without Borders." Residents living within the Neenah Joint School District boundary are being asked for their input regarding the future of the District&apos;s facilities and a potential referendum in a community survey. A full week of events will take place during Neenah High School&apos;s 2018 homecoming activities Oct. 1-6. Three Neenah schools are among just 13 statewide honored with a National Healthy Schools Award by the Alliance for a Healthier Generation. Neenah High School technical education students will gain additional experiences in welding and metal fabricating through a significant donation from Innovative Machining, LLC. Tickets are on sale for Neenah High School&apos;s fall musical, "Chicago," which runs for five shows Sept. 26-30 in Pickard Auditorium. Neenah High School had 55 students honored for exceptional achievement on Advanced Placement exams during the 2017-18 school year. A community survey to gauge interest and determine priorities for a potential referendum was reviewed by the Neenah Joint School District Board of Education at its September 5 meeting. Neenah High School will name its tennis courts in honor of longtime boys&apos; coach Tom Berven in a dedication ceremony on the courts on Friday, Sept. 21 at 5 p.m. Noted Human Performance Expert John Underwood to Speak at Neenah H.S. Nationally-recognized human performance expert John Underwood will speak at Neenah High School on Wednesday, Sept. 12 at 7 p.m. in an event that is free and open to the public. Five Neenah students participated in an entrepreneurship event called "Bridge and Build" that was organized by the Wisconsin Academy of Global Education and Training earlier this month in Milwaukee. Senior Kayla Kraus and the Act II show choir welcomed back the Neenah Joint School District staff with a student-led convocation for the ninth straight year. Fans of Neenah High School athletics will have the opportunity to purchase season passes for both home and away events for the 2018-19 school year. Tickets for the 2018 Neenah Joint School District Hall of Fame induction banquet are now on sale to the general public at the District Administration Building. For just the third time since 1930, Neenah High School has hired a boys tennis coach. Neenah High School will have two new varsity golf coaches for the upcoming school year as Chad Berken will coach the girls team and Isaac Quella takes over the boys program. Dates have been set for the 2018-19 Open House and Fees and Forms Days across the Neenah Joint School District. Check out each school&apos;s dates and times. A former major leaguer will direct the Neenah High School varsity baseball team next spring as Jack Taschner has been named the Rockets&apos; head coach. Neenah Joint School District buildings will see a significant upgrade in safety and security through a grant provided by the Wisconsin Department of Justice School Safety Grant program on Thursday. After 48 illustrious seasons as the Neenah High School varsity boys tennis coach, Tom Berven has finally decided to call it a career. Nine Neenah Joint School District schools have been rewarded for their work with developing positive behaviors in schools by the Wisconsin Response to Intervention Center. Neenah High School teacher Brian Borchardt was recently recognized for his extensive community service efforts with an award from the Neenah Rotary Club. Neenah Joint School District parents, staff and community members are invited to view Human Growth and Development lesson plans and materials recommended for grades K-5 on Tuesday, June 12 from 4-8 p.m. at the Administration Building at 410 S. Commercial St.
A study of Neenah Joint School District facilities will continue with Board of Education meetings scheduled each month from June through September. Neenah High School senior Colin Enz became the school&apos;s first boys track and field individual state champion in 20 years by capturing the 400-meter dash title on Saturday in La Crosse. Neenah High School&apos;s top senior students academically and athletically were honored at the Senior Class Award Ceremony as part of the graduation rehearsal on May 30 in the Ron Einerson Fieldhouse. The Online Registration annual update is now open on the Parent Portal for families to complete their annual update of information as well as release forms and waivers. The details of a community survey consumed much of the Neenah Joint School District Board of Education meeting regarding the future of District facilities on May 23 at the Shattuck Middle School Auditorium. The corner of Wisconsin Avenue and Commercial Street in downtown Neenah now has a historical flair as Neenah High School art students partnered with the Neenah Historical Society to paint an electrical control box. Neenah High School will graduate 460 seniors at commencement ceremonies on Wed., May 30 at 7 p.m. in the Ron Einerson Fieldhouse. A group of 22 Neenah Joint School District staff members with a total of 507 years of experience will retire after the 2017-18 school year. A grant from Bemis Company, Inc. will provide $100,000 to help every elementary student in Neenah learn Project Lead the Way activities in their school curriculum over the next two years. Neenah High School juniors Jackson Vendola and David Xiao both earned perfect scores on the ACT college prep exam. Eight individuals and one team of staff members have been recognized as the Neenah Joint School District&apos;s Employees of the Year for the 2017-18 school year. The Educational Foundation of Neenah will honor 17 Neenah Joint School District educators in its inaugural "Rocketing Ahead: Celebration of Education" Teaching Awards. A showing of Shakespeare&apos;s The Tempest will take the stage for four shows April 19-22 for Neenah High School&apos;s spring drama event in Pickard Auditorium. For the second straight year, Roosevelt Elementary School has been honored as a Wisconsin Title I School of Recognition Award recipient by the Wisconsin Department of Public Instruction. Neenah High School&apos;s Arete Academy held its third annual Heroes Ceremony on Friday and honored Bob Totten and Erin Stoffel for their contributions to the Neenah community. The next Neenah Joint School District Board of Education meeting regarding the District facilities study has been set for Wednesday, May 23 at 5 p.m. at the Shattuck Auditorium. Determining values and next steps were the topics for the Neenah Joint School District Board of Education at a fourth facilities study meeting on April 5 at Shattuck Middle School. Neenah won national championships in two separate divisions at the high school national powerlifting championships at the Radisson Paper Valley Hotel in Appleton. Individuals who made their impact as a physician, suffragist, writer, referee and soccer coach comprise the Neenah Joint School District&apos;s fourth annual Hall of Fame class in 2018. Neenah Joint School District families are invited to participate in the second annual "STEAM Saturday" on Saturday, April 21 at Neenah High School. Wilson Elementary School in Neenah has been named one of seven "Program of Promise" award winners by the Wisconsin School Counselor Association (WSCA). Students from Shattuck and Horace Mann Middle Schools will present five shows of Annie, Jr. from March 8-11 in Pickard Auditorium at Neenah High School. Neenah High School senior Beau Yineman became the school&apos;s eighth state individual wrestling championship in dramatic fashion on Saturday night in Madison. Neenah High School senior Evan Arnold has been named the state&apos;s top youth high school volunteer by the Prudential Spirit of Community Awards. Neenah captured its first Wisconsin Interscholastic Fishing Association state championship on Feb. 18-19 in Minocqua, dethroning three-time defending champion Wisconsin Rapids. Neenah High School teacher Deb Garbe has been named the Wisconsin ProStart Teacher of the Year by the Wisconsin Restaurant Association Education Foundation. Four public Board of Education meetings to address the future of Neenah Joint School District facilities will be held during an eight-week span beginning in mid-February. Neenah High School will present four showings of the comedic play, "Almost, Maine" on Feb. 1-3 at Pickard Auditorium. Five-year-old kindergarten enrollment for the 2018-19 school year is scheduled for Mon.-Thurs., Feb. 12-15. Neenah High School&apos;s VEX Robotics team qualified for both the state and U.S. Open championships after winning the tournament championship at the Northeast Wisconsin competition this past weekend in Oconto Falls. Four-year-old kindergarten registration for the 2018-19 school year will take place online beginning March 12. Destinee Ramos may only be in eighth grade, but she&apos;s already spoken in front of a former United States president and the commissioner of the National Football League. Four Neenah students placed among the top 10 percent of 23,000 participating students nationwide in the Noetic Learning Math Contest. Neenah High School will host an academic planning night for students and their parents on Wed., Dec. 13. Neenah students will be among over 100 million students globally who will participate in an "Hour of Code" during the week of Dec. 4-10. Did you know the Neenah Joint School District has over 40 designated, scholarship and special project funds to assist students in enhancing their education? Eleven Neenah Joint School District schools increased their overall score and the District achieved an overall "Exceeds Expectations" rating on the 2016-17 state report card data from the Department of Public Instruction. Four grants have been awarded to NJSD staff members through the Vera and Carol Tipler Awards. One of Neenah High School&apos;s most uplifting annual events takes place on Thursday, Nov. 16 when the Special Olympics basketball team takes center stage with the varsity boys basketball team. Neenah High School sophomore Av Osero successfully defended her individual state diving championship and Neenah posted its highest finish ever at the state swimming and diving meet Saturday in Madison. Three Neenah High School seniors have been named commended students for the prestigious National Merit Scholarship Program. Neenah High School is offering free ACT prep classes in February for current juniors. Neenah community members will have the opportunity to get needed assistance and help others with the addition of a "Blessing Box" in front of Horace Mann Middle School. Neenah High School senior Kiki Risgaard captured the WIAA state girls tennis singles title with five straight-set wins over the weekend in Madison. Risgaard became the second Neenah player to win a state girls singles title, joining Tami Whitlinger who won four straight from 1983-86. For the second straight year, 11 schools from the Neenah Joint School District were among the 68 winners of the Wisconsin Department of Public Instruction&apos;s 2017 Wisconsin School Health Awards. Neenah High School will host six shows of its fall musical, Damn Yankees, beginning on Thurs., Oct. 12 in Pickard Auditorium. Tickets are now on sale for all shows both online and at the high school. Tullar Elementary School hosted Wisconsin Governor Scott Walker&apos;s signing of the state budget on Sept. 21. A full week of activities highlight the Neenah High School homecoming week set for Sept. 25-30. A simple pajama and hat day at Lakeview Elementary turned into significant assistance for hurricane victims in Texas and Florida. After 18 years of teaching in the Neenah Joint School District, Amy Schumacher has been named the principal at Clayton Elementary School. Senior McKenna Seegers and the Touch of Class orchestra welcomed back the Neenah Joint School District staff with a student-led convocation for the eighth straight year. Neenah High School had 64 students honored for exceptional achievement on Advanced Placement exams during the 2016-17 school year, including Dante Cardelli, who qualified for the National AP Scholar Award. A highly successful season for the Neenah High School fishing team has resulted in the team earning the inaugural Wisconsin Interscholastic Fishing Association High School Team of the Year Award. Elementary school students in the Neenah Joint School District will benefit from a school-based mental health program with a $300,000 grant through the Basic Needs Giving Partnership of the Community Foundation for the Fox Valley Region. Neenah High School didn&apos;t have to look far for a new varsity softball coach as Shattuck Middle School teacher Steven Gross has been named to the position. One of Neenah&apos;s longtime coaches will be honored posthumously on July 26 when the Neenah Joint School District re-dedicates the Ivy Williams tennis courts near Shattuck Middle School. Online Registration is now available for Neenah Joint School District families for the 2017-18 school year. Seven Neenah Joint School District schools have been rewarded for their work with developing positive behaviors in schools by the Wisconsin Response to Intervention Center. Neenah High School&apos;s boys tennis team finished as state runner-up for the second straight year and third time in five years at the WIAA state team tournament over the weekend in Madison. A longtime area youth soccer coach, Brian Ross has been named the head coach of the Neenah High School boys varsity program. Neenah High School honored students for accomplishments in academics, athletics and music with senior awards presented during the graduation rehearsal on May 31. Shattuck Middle School students Brookyln Anderson and Nick Bentley were winners of the Wisconsin Crystal Growing Contest through the UW-Madison Department of Chemistry. Neenah High School will graduate 431 seniors at commencement ceremonies on Wed., May 31 at 7 p.m. in the Ron Einerson Fieldhouse. The Velocity program at Shattuck Middle School was one of only two schools in Wisconsin and one of 32 nationwide to receive an Ascend Gold Medal for its implementation of an online math intervention program. An inaugural event to raise awareness for mental health services in the Fox Valley will be held on June 16 at Fox Cities Racquet Club in Appleton. The Neenah Joint School District, in conjunction with Post-Crescent Media, will host a panel discussion for parents, staff, students and concerned community members to address the issues raised by the Netflix series 13 Reasons Why and to talk about ways to prevent suicide and build resilience for children. A four-year veteran Activities Director and Associate Principal, Josh Murnane has been selected for the same position within the Neenah Joint School District. The position is pending school board approval. A group of 13 Neenah Joint School District staff members will retire after the 2016-17 school year. The group consists of three certified teaching staff members and 10 non-certified employees. The Neenah Joint School District has been recognized as one of "America&apos;s Healthiest Companies" with a prestigious Well Workplace Award from the Wellness Council of America. Eight individuals and one team of staff members have been recognized as the Neenah Joint School District?s Employees of the Year for the 2016-17 school year. Neenah High School biology teacher Dianne Pacolt has been selected as an Outstanding Teacher of High School Biology by the University of Wisconsin-Stevens Point Biology Department. Neenah High School&apos;s spring drama event will feature a family-friendly production with four showings of James and the Giant Peach April 27-30 in Pickard Auditorium. Roosevelt and Taft Elementary Schools in Neenah have been chosen as 2016-17 Wisconsin Title I School of Recognition Award recipients by the Wisconsin Department of Public Instruction. Wisconsin Governor Scott Walker experienced some of Neenah?s art and music talent and touted increased spending for public education during a visit to Neenah High School on Thursday. Neenah High School English teachers Jennifer Heidl-Knobloch and Tara Rockweit have been selected as winners of the University of Wisconsin-Oshkosh Cooperative Academic Partnership Program (CAPP) Adjunct of the Year award. While some Neenah high school students spent their spring breaks on beaches or just simply relaxing, a group of students assisted in building housing projects for elderly people in rural Kentucky. Five prominent alumni and former staff members of the Neenah Joint School District will comprise the District&apos;s third annual Hall of Fame class in 2017. Neenah Joint School District Teams With Georgia-Pacific for "STEAM Saturday"
Neenah elementary students will have the opportunity to participate in an interactive, hands-on learning experience in cooperation with Georgia-Pacific on Sat., April 8 at Neenah High School. Neenah teacher Andra Mory and student Kim Kemppainen were both honored with awards from the Herb Kohl Educational Foundation. Mory received a Teacher Fellowship Award, while Kemppainen was the recipient of an Excellence Scholarship. Over 260 athletes from across the state will compete at Neenah High School on Saturday, March 25 in the Special Olympics of Wisconsin basketball skills competition in the Ron Einerson Fieldhouse. George Grigsby, the second-longest tenured superintendent in Neenah Joint School District history, passed away on Sunday, March 19 at the age of 89. Tristain Prosper, a 2016 graduate of Neenah High School, has been named the inaugural recipient of the National Ripken Foundation Scholar Award. Prosper is the only recipient of the award that carries a $50,000 college scholarship. Neenah middle school students will perform five shows of The Lion King, JR. on the weekend of March 9-12 in Pickard Auditorium at Neenah High School. Neenah High School administrators, faculty and students will meet with representatives from local companies as part of the inaugural Business and Education Summit on March 20 from 5-7 p.m. at the high school. The Neenah Joint School District continues to be at the forefront of mental health issues with numerous services for its students and families unique to districts across the state. Neenah High School&apos;s Rocket Players will host four shows of the Musical Comedy Murders of 1940 for the winter drama Feb. 2-4 in Pickard Auditorium. The Neenah High School boys track and field team will host the 11th annual Rocket Blast Off 5K run/walk on Sat., March 4 at Memorial Park in Neenah. Employee wellness has been an area of focus for the Neenah Joint School District in recent years and it now has a new leader in Sara Moore. The Neenah Joint School District will be the lone public school district represented at Governor Scott Walker&apos;s State of the State Address on Tuesday, Jan. 10 at the state capitol in Madison. A group of students and staff members received a special invitation from the Governor. Neenah orchestra students from middle school through high school will have the opportunity to perform on stage with the national touring group Barrage 8 during a concert on Wed., Feb. 22 at 7:30 p.m. in Pickard Auditorium. A retired Neenah High School English teacher has been named Wisconsin&apos;s Poet Laureate by the Wisconsin Poet Laureate Commission. A unique venue will host a high school wrestling match for the first time on Thurs., Jan. 5 when Neenah and Hortonville square off on the stage of historic Pickard Auditorium. Three Neenah Joint School District schools&apos; recent state report card scores ranked among the top 25 schools statewide at their respective level. Fresh off Neenah High School&apos;s first state girls volleyball championship since 1978, head coach Bruce Moriarty has decided to call it a career. The Neenah High School Arete Academy will host a free public showing of the film, Most Likely to Succeed, with a discussion to follow, on Thursday, December 8 at 6:30 p.m. in the Shattuck Middle School Auditorium. Every school in the Neenah Joint School District maintained its high rankings by meeting or exceeding state expectations in the recently released 2015-16 state report card data from the Department of Public Instruction. One of Neenah High School&apos;s most uplifting annual events takes place on Thursday when the Special Olympics basketball team takes center stage with the varsity boys basketball team. Neenah High School freshman Av Osero became the school&apos;s fourth WIAA Division state girls diving champion in the past five years at Saturday&apos;s state meet in Madison. Neenah captured its first WIAA state girls volleyball championship since 1978 with a three-set sweep of Burlington on Nov. 5 at the Resch Center in Green Bay. Neenah Joint School District students outperformed students across the state in every area of recently released Wisconsin Student Assessment System results for public school students in grades 3-11. Taxpayers in Neenah will see a significant decrease in payments to the Neenah Joint School District in 2017 as the District&apos;s mill rate will drop 52 cents and remain the lowest in the Fox Valley at $8.05. Neenah High School&apos;s Arete Academy received a $10,000 grant from the America&apos;s Farmers Grow Rural Education Program to help develop a greenhouse area behind the school. Senior Christina Price and junior Kiki Risgaard rolled to Neenah&apos;s first WIAA state girls tennis doubles championship since 2002 with straight set victories in all five of their matches over the weekend in Madison. Two Neenah schools are among 85 schools nationwide to receive $1,000 grants from Action for Healthy Kids for initiatives that support schools in promoting health and wellness. Neenah High School senior Ryan Roekle has been named a semifinalist for the prestigious National Merit Scholarship Program. A full week of free family activities benefitting the Neenah High School Orbit will highlight the Neenah Joint School District Homecoming Week set for Oct. 10-14. Neenah High School will host six shows of its fall musical, Spamalot, beginning on Thurs., Sept. 29 in Pickard Auditorium. Tickets are now on sale for all shows both online and at the high school. Students from Horace Mann Middle School will enjoy a unique outdoor learning experience for the second straight year at Camp Anokijig in Sheboygan County Sept. 19-23. Horace Mann and Shattuck Middle Schools and Spring Road Elementary School in Neenah were among 21 Wisconsin schools honored as Let&apos;s Move! Active Schools National Award winners. Eleven schools from the Neenah Joint School District were among the 68 winners of the Wisconsin Department of Public Instruction&apos;s 2016 Wisconsin School Health Awards. The Neenah Joint School District Health and Wellness Center officially opened on Sept. 7. Staff members and their families are welcome to make appointments or simply walk in during open hours. Neenah High School was the only school to earn multiple WIAA state tournament sportsmanship awards during 2015-16, earning the honor in girls and boys tennis. Neenah Joint School District staff members made generous donations to those in their local community and beyond as part of their first day of the 2016-17 school year on August 29. A student-led convocation welcomed back Neenah Joint School District staff for the 2016-17 school year. Neenah High School had 74 students honored for exceptional achievement on Advanced Placement exams during the 2015-16 school year, including Ian de Wet and Adelle Sturgell, who qualified for the National AP Scholar Award. Fans of Neenah High School athletics will have the opportunity to purchase season passes for both home and away events for the upcoming 2016-17 school year. Seven Neenah High School students participated in the weeklong Badger Boys and Girls State program this summer to learn more about government and leadership. Families of Neenah Joint School District students should watch their U.S. mail for information regarding a new online registration system for 2016-17. Two Neenah middle schools are among an elite group of schools nationwide honored with a National Healthy Schools Award by the Alliance for a Healthier Generation. The Neenah Joint School District is seeking volunteers to serve on an advisory committee that will assist in reviewing the human growth and development curriculum. A longtime Neenah Joint School District teacher has been named the new principal at Roosevelt and Alliance Elementary Schools. Four Neenah Joint School District elementary schools have been rewarded for their work with developing positive behaviors in schools by the Wisconsin Response to Intervention Center. A total of 16 Neenah Joint School District employees who are retiring following the 2015-16 school year have selected books to be placed in their respective school&apos;s library. Every Neenah Joint School District elementary class will add Project Lead the Way Launch activities to their science curriculum as a result of a $75,000 grant from Bemis Company, Inc.
Eliza Duimstra of New Hope Christian School won the 53rd annual Neenah city-wide fifth grade spelling bee, outlasting 14 other competitors on May 6 at the Boys and Girls Brigade. Eight individuals and one team of teachers have been recognized as the Neenah Joint School District&apos;s Employees of the Year for the 2015-16 school year. Alumni of Neenah High School are asked to respond to a request for biographical information for a graduate directory. Melissa Chrisman will move into a new principal role in Neenah at Hoover Elementary after spending the past two years at Roosevelt Elementary and Alliance Charter Schools. Lakeview Elementary fourth grade teacher Alisia Myers is one of two Wisconsin teachers and 154 teachers nationwide selected to participate in the weeklong Mickelson Teachers Academy July 17-22 in Jersey City, N.J.
Neenah High School chemistry teacher Shelley Dorner has been named one of five inaugural winners of the University of Wisconsin-Oshkosh CAPP Adjunct of the Year award. Jeff Spoehr concluded nine years of service to the Neenah Joint School District Board of Education at the April 19 meeting. With 10 varsity letters and success in the classroom and community, Neenah High School senior Alyssa Barnes has been honored as a recipient of the WIAA Scholar-Athlete Award. Two Neenah Joint School District projects were each recipients of $5,000 environmental education grants from SCA. Neenah High School will host four showings of the comedy "After Juliet" for the school&apos;s spring play April 14-16 in Pickard Auditorium. Neenah High School boys and girls diving coach Tim Foulks has been named a recipient of the David H. Robertson Award by the National Interscholastic Swimming Coaches Association of America. An international speaker and noted author on a variety of autism-related topics will hold a public presentation on April 27 at 7 p.m. in the Shattuck Middle School Auditorium in Neenah. Roosevelt Elementary fifth grade student Elisa Hein has been selected as the school&apos;s first winner of a $1,000 college scholarship from the Carson Scholars Fund. Neenah High School senior Adelle Sturgell has been selected as a Herb Kohl Excellence Scholarship recipient for her exceptional scholarship, leadership, citizenship and school and community involvement. With numerous student and staff groups giving back to their local community, the Neenah Joint School District has been honored with the Civic Partner of the Year Award from Future Neenah. Neenah High School is seeking lifeguards for 2016 summer swimming lessons. There will be two sessions offered during the summer from June 13-July 7 and July 18-August 11. The lessons will take place from 4-6:15 p.m.
Neenah Middle Schools Present High School Musical, Jr.
Students from Shattuck and Horace Mann Middle Schools will present five shows of Disney&apos;s High School Musical, Jr. on the weekend of March 17-20 in the Shattuck Auditorium. Neenah Joint School District parents who have previously participated in the Love and Logic course will have the opportunity to participate in an upcoming two-day refresher course. Seven prominent alumni and former staff members of the Neenah Joint School District comprise the District&apos;s second annual Hall of Fame class in 2016. Neenah High School co-head boys hockey coaches Mike Elkin and Jeff Lindemann have been named the Bob Johnson state coaches of the year by the Wisconsin Hockey Coaches Association. Nearly every student in the Neenah Joint School District who lives more than two miles from school will be eligible for transportation in 2016-17 following a policy change by the Board of Education at its March 1 meeting. The United States Air Force Band of Mid-America will hold a free performance at Pickard Auditorium at Neenah High School on Sat., March 19. The concert begins at 6:30 p.m. and doors open at 5:30 p.m.
Neenah to Host Screening of "Most Likely to Succeed"
The future of education will be the focus when the Neenah Joint School District hosts the Fox Valley&apos;s first screening of the film "Most Likely to Succeed" on March 9 in Pickard Auditorium at Neenah High School. Neenah High School seniors Alex Mootz and Irik Lloyd spent their day on Feb. 18 at the State Capitol in Madison speaking to legislators about their opportunities in the Youth Apprenticeship program. Neenah Joint School District staff members and their families will have the opportunity to have their medical needs addressed on-site with the addition of a Wellness Center at Shattuck Middle School. A wide array of unique course offerings that appeal to students at all levels and abilities are part of the Neenah Joint School District?s 2016 summer program. The Neenah High School boys track and field team will host the 10th annual Rocket Blast Off 5K run/walk on Sat., March 5 at Memorial Park in Neenah. Emmy-winning composer and former Trans-Siberian Orchestra member Mark Wood will join the Neenah middle school and high school orchestras for an electrifying performance on Feb. 18 at 7 p.m. in Pickard Auditorium. Neenah High School&apos;s Rocket Players will perform four shows of "Anatomy of Gray" for their Winter Drama Feb. 4-6 in Pickard Auditorium. Neenah students outperformed state averages at all levels in both English/Language Arts and Mathematics as part of the Wisconsin Student Assessment System. Enrollment week has been set for Feb. 8-12 for the Neenah Joint School District five-year-old and four-year-old kindergarten programs. The registration deadline for enrollment in the Neenah Joint School District magnet program is Mon., Jan. 4. Shattuck Middle School&apos;s library has been named the Wisconsin Library of the Month by the Wisconsin Division for Libraries and Technology. Alumni and community members are welcome to provide feedback regarding the Neenah Nation, which will connect all stakeholders with the District. Neenah High School didn&apos;t have to look far for its new head boys soccer coach as Activities Director Nate Werner has been selected to lead the Rockets&apos; program. Ninth grade students at Neenah High School performed numerous acts of community service this fall as part of the Freshman Seminar program, benefitting individuals and organizations throughout the local area. Neenah High School&apos;s one-act play "Bubble Boy" earned numerous awards at the State Theatre Festival last weekend in Whitewater. Neenah High School&apos;s Special Olympics basketball team will compete in a prime time game in the Ron Einerson Fieldhouse following the varsity boys basketball team&apos;s annual "Meet the Rockets" night on Nov. 19. Art students at Neenah High School partnered with students in the technology education department to create a unique display honoring our nation&apos;s veterans that was unveiled on Veterans Day. Spring Road Elementary School in Neenah earned first place in the medium school division of the School Specialty School Challenge for participation in the recent Community First Fox Cities Marathon events. After leading Neenah to its first WIAA state girls tennis championship, Kelly Van Handel has been named the Wisconsin High School Tennis Coaches Association Division 1 Coach of the Year. Neenah&apos;s girls tennis team captured its first WIAA state championship with a 4-3 win over Brookfield East on Saturday at the Nielsen Tennis Center in Madison. Roosevelt and Alliance Elementary Schools partnered with Georgia-Pacific for a family night of STEM activities on Oct. 15. Neenah Girls Team Up With Local Professionals at "Smart Girls Rock"
Over 70 Neenah High School freshman and sophomore girls teamed up with female professionals from throughout the Fox Valley in the inaugural "Smart Girls Rock" event on Oct. 20. Neenah High School students had the opportunity to explore a variety of post-secondary and career options at a College and Career Conference on Oct. 19. A meeting for parents interested in enrolling their children in the Neenah Joint School District magnet program will be held on Nov. 10 at 5pm in the Shattuck Middle School Auditorium. A truck filled with supplies donated by the local community in an event organized by two Neenah fifth grade students has arrived in South Carolina. Third grade students at Taft Elementary School have been learning about the importance of saving money and will have a chance to start their own savings account in an upcoming piggy bank contest. Neenah High School senior Adelle Sturgell has been named a semifinalist for the prestigious National Merit Scholarship Program. Two Neenah fifth grade students enlisted the help of N&M Transfer Company to create a "Flood the Truck" event to aid victims in cleanup of the recent flooding in South Carolina. Counselors and psychologists in the Neenah Joint School District are helping parents tackle many of their toughest issues in a seminar called "Parenting the Love and Logic Way." Ten of the Neenah Joint School District&apos;s most prominent alumni and former employees were honored at the District&apos;s inaugural Hall of Fame banquet on Sat., Oct. 3 at Bridgewood Resort in Neenah. The Neenah High School fall musical, Joseph and the Amazing Technicolor Dreamcoat, is set for six shows on two October weekends in Pickard Auditorium. An assistant coach for the past two WIAA Division 1 state championship wrestling teams, Kyle Kleuskens has been named the head coach at Neenah High School. A full week of free family activities benefitting the Make-A-Wish Foundation will highlight the Neenah Joint School District Homecoming Week set for Sept. 28-Oct. 2. A unique and free event will be held in the Neenah Joint School District to connect elementary school parents with professionals from various local services and organizations. Three Neenah schools were among 34 schools statewide that earned Wisconsin School Health Awards from the Department of Public Instruction. Neenah graduates posted their highest ACT scores since 2011 with a 24.2 composite score. All Neenah Joint School District students in grades 3-12 are using their own personal computing device beginning in the 2015-16 school year. Neenah High School students David Lang and Beatrice Padgham have been selected to serve as student representatives to the Neenah Board of Education during the 2015-16 school year. For the sixth straight year, a unique student-led convocation welcomed back Neenah Joint School District staff members in Pickard Auditorium. Fans of Neenah High School athletics will have the opportunity to purchase season passes for both home and away events for the upcoming 2015-16 school year. Sixth grade students in the Neenah Joint School District will have the unique opportunity for outdoor learning and team building by spending two days at Camp Anokijig in Sheboygan County. Neenah High School had 77 students honored for exceptional achievement on Advanced Placement exams during the 2014-15 school year, including four students who qualified for the National AP Scholar Award. About 100 desks no longer used by Neenah students will be delivered to students in Liberia through a donation by the Neenah Joint School District to the International Children&apos;s Fund (ICF). Neenah High School science teacher Scott Hertting has been awarded the Presidential Award for Excellence in Mathematics and Science Teaching. The award is one of the highest honors in teaching and is bestowed on just two teachers from each state and 108 total teachers nationwide. A total of 12 students from various grade levels were honored for their creative writing in the annual Neenah Public Library Proces Poetry Prize Contest. Horace Mann Middle School in Neenah is one of 250 schools nationwide honored as with a National Healthy Schools Award by the Alliance for a Healthier Generation. Neenah High School junior Sam Galloway has been named the Golf Coaches Association of Wisconsin State Player of the Year. Help Coolidge Elementary win $20,000 for its Playground Project through the Let&apos;s Play grant courtesy of Dr. Pepper and Snapple. Vote once per day through June 29. A highly successful local junior college men&apos;s basketball coach over the past six years, Lee Rabas has been named the head boys basketball coach at Neenah High School. Junior Sam Galloway became the second Neenah High School athlete to win a WIAA state boys golf individual title by shooting a two-under par 142 to capture the Division 1 crown Tuesday at University Ridge Golf Course in Madison. Join the Neenah Quarterback Club in its efforts to renovate Rocket Stadium at the third annual Nick Dohr Golf Outing on Sat., August 8. Spring Road Elementary and Hoover Elementary Schools in Neenah have been recognized for their efforts in helping students walk to school with awards by the East Central Safe Routes to School Program. Students at Horace Mann Middle School in Neenah will be walking in memory of the victims of the recent shooting at the Trestle Trail bridge during the school&apos;s upcoming walk-a-thon on May 22. Over 500 years of Neenah Joint School District teaching experience was honored on Wednesday night at the District&apos;s 52nd annual Quarter Century Club Dinner at the Riverwalk Hotel. A project that began in the fall of 2014 has assisted numerous families across the Neenah Joint School District with basic household items. Neenah High School&apos;s Finance Bowl team of Matt Bourland, Ally Kaul, Olivia Stindt and Evan Thomsen captured the state championship on April 29 in Milwaukee. Neenah&apos;s top fifth grade spellers competed in the 52nd annual city spelling bee on Friday with Kalyan Krueger-Olson of Alliance Charter Elementary taking the title at the Boys&apos; and Girls&apos; Brigade. Eight individuals have been recognized as the Neenah Joint School District&apos;s Employees of the Year for the 2014-15 school year. Neenah Joint School District employees have made an added emphasis on wellness during the 2014-15 school year by participating in the Humana Vitality program. Hoover Elementary students will have the chance to learn from two well-known children&apos;s musicians as Tom Pease and Stuart Stotts spend three days in residency and prepare students for an all-school concert on May 15. Through a partnership with the Winnebago County Safe Driving Coalition, students at Neenah High School are learning about safe driving through a week&apos;s worth of activities April 20-25. Autism awareness within the Fox Cities will be the focus of an informational event on May 7 at Shattuck Middle School in Neenah. Neenah High School&apos;s Special Olympics basketball team captured a state championship by winning its division at the state indoor sports tournament on April 12 in Oshkosh. Neenah High School&apos;s Rocket Players will present their annual spring comedy production with four shows of "The Man Who Came to Dinner" on April 16-18 in Pickard Auditorium. Coolidge Elementary teachers have been awarded a fellowship grant from the Department of Public Instruction in connection with the School of Recognition Award the school earned last fall. Horace Mann Middle School teacher Anna Zimmers is one of 16 teachers nationwide selected to participate in a five-week summer seminar on Punishment, Politics and Culture at Amherst College in Massachusetts. For the first time in 21 years, the Neenah Joint School District has three teachers who received Fellowships from the Herb Kohl Educational Foundation in the same year. In addition, two Neenah senior students were honored with Kohl Excellence Scholarships. Registration for the Suzuki Talent Education Program is due April 3. Click on the header for more information and meeting dates. A distinguished group of 10 alumni and former teachers in the Neenah Joint School District have been honored as inaugural members of the District&apos;s Hall of Fame. Four Neenah High School students were among the eight total award winners at the 2015 Fox Valley Area High School Glass Exhibition. Neenah Middle School Students to Perform Little Mermaid, Jr.
Neenah middle school students will perform four shows of the Disney production Little Mermaid, Jr. March 12-15 at the Shattuck Middle School Auditorium. The Neenah Joint School District has selected two individuals to fill principal vacancies at Clayton and Taft Elementary Schools. A project that started behind the idea of 2014 Neenah High School graduate Nick Munce and became a collaboration of students from seven local high schools was recognized on Feb. 24. Students in Neenah High Schools digital electronics classes teamed with representatives from Bemis Company, Inc. to learn career success strategies on how to get and keep a job in high-growth industries. Neenah High School?s VEX Robotics team had two impressive performances last week, including a winning team at the state championship meet that qualified for the world championships April 15-18 in Louisville. Neenah Joint School District parents will have the opportunity to learn about social media safety through presentations by the Winnebago County Sheriff?s Department Feb. 25 and 26. Neenah High School&apos;s Rocket Players will perform four shows of the drama "Unspoken For Time" Feb. 5-7 in Pickard Auditorium. Check out the latest edition of the NJSD Connections staff and community newsletter. Another edition of the popular parenting seminar called ?Parenting the Love and Logic Way? is coming to Neenah this spring. Counselors and psychologists in the Neenah Joint School District are helping parents tackle many of their toughest issues through this seminar. Every elementary classroom in the Neenah Joint School District will have Smart Boards for the 2015-16 school year after the District was awarded a $50,000 grant through the Wisconsin Technology Initiative. Tori Rondeau, a fifth grade student at Lakeview Elementary School in Neenah, recently won the 2015 Dr. Martin Luther King, Jr. Essay Contest. Jackie Munoz-Ellmann, currently principal at Clayton Elementary School, has been named the new principal at Horace Mann Middle School. Families of Neenah High School students are receiving assistance through a new program called the Orbit. A special night of tradition and history will take place Sat., Jan. 3 at the Neenah High School Fieldhouse as all 26 of Neenah?s WIAA state boys basketball tournament teams will be honored. Children in the Neenah Joint School District will have the opportunity to attend a four-year-old kindergarten program beginning in the 2015-16 school year. A recent safe driving online voting campaign netted Neenah High School a $25,000 grant from State Farm Insurance. Numerous community organizations benefitted from Neenah High School freshman students during projects by their Freshman Seminar classes this fall. The Neenah Joint School District?s community newsletter, the Dialogue, recently received an Award of Excellence, the top honor bestowed by the Wisconsin School Public Relations Association. The Neenah Joint School District didn&apos;t have to look far for its new Director of Business Services, selecting Director of Facilities/Engineer Andrew Thorson for the position. Students in Neenah High Schools Freshman Seminar classes are participating in a first-time Wellness Week. The week features a variety of workshops for students to attend to help them practice new ways to take care of themselves in times of stress, sadness and trouble. Each student will attend three sessions of their choice on three different days. Staff members are leading the sessions in a wide range of different activities. Spring Road Elementary School hosted a Science, Technology, Engineering and Mathematics (STEM) Family Night in conjunction with Georgia Pacific on Nov. 13. 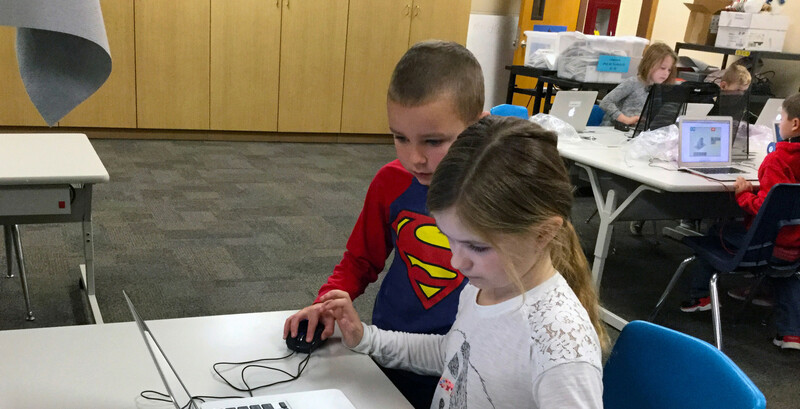 Neenah Elementary students enjoyed success in the recent Sumdog regional math contest with the top four performing classes and the top 14 individual performers. Neenah High Schools Special Olympics basketball team will compete in a prime time game in the Ron Einerson Fieldhouse following the varsity boys basketball teams annual Meet the Rockets night on Nov. 20. Veterans representing all major military branches and conflicts back to World War II spoke to students at Neenah?s Shattuck and Horace Mann Middle Schools on Nov. 7. The Veterans were from the Wisconsin Veterans Home in King and the Knights of Columbus. Neenah was represented by 12 students at the Wisconsin School Music Association State Honors Music Project last week at the State Teachers Convention in Madison. Seven individuals from the Neenah Joint School District and local agencies are attending a week-long training in Madison to become certified trainers in Youth Mental Health First Aid. The seventh annual Fox Valley Association "Dig for the Cure" volleyball event will be held at Neenah High School&apos;s Ron Einerson Fieldhouse on Oct. 18. The event is a fundraiser among all 10 Fox Valley Association schools to help raise money and awareness for breast cancer. Fifty students from Neenah High School?s Manufacturing and Engineering Academy recently had the opportunity to tour Plexus Corporation?s Neenah Operations manufacturing facility and learn hands-on experience from Plexus engineers. Neenah High School had 111 students honored for exceptional achievement on Advanced Placement exams during the 2013-14 school year, including five students who qualified for the National AP Scholar Award. Sandy Kasper took a courageous journey on the road to significant lifestyle changes. After dropping over 60 pounds and regaining balance in her life, the Neenah Joint School District Administrative Assistant has been named the Light of Wellness Healthy Behavior Award winner by the Wellness Council of Wisconsin. For the second straight year, Neenah High School?s Homecoming week will take on a bigger purpose, as events during the week will benefit the school?s Special Education Department in memory of a classmate. Three Neenah High School seniors have been selected as semifinalists for the prestigious National Merit Scholarship Program. Hoover and Spring Road Elementary Schools in Neenah have been recognized by the Wisconsin Department of Instruction with Gold Wisconsin School Health Awards. Every school in the Neenah Joint School District maintained its high rankings by meeting or exceeding state expectations in the recently released 2013-14 state report card data from the Department of Public Instruction. "Neenah With Pride ignited by a Passion for Excellence" is the Neenah Joint School District&apos;s newly minted mission statement as adopted by the Board of Education. Coolidge Elementary School in Neenah has been selected as a 2014-15 Wisconsin Title I School of Recognition Award recipient by the Wisconsin Department of Public Instruction. Neenah High School students Madeline Hibbs-Magruder and David Lang have been selected to serve as student representatives to the Neenah Board of Education during the 2014-15 school year. Fans of Neenah High School athletics will have the opportunity to purchase season passes for the upcoming 2014-15 school year. Neenah students again posted ACT scores well above the state averages during the 2013-14 school year with a 24.1 composite score for the third straight year. It was a long time coming, but students and families at Wilson Elementary finally have a new playground for the 2014-15 school year. Neenah Joint School District students will learn Chinese firsthand from a native speaker during 2014-15 as Yan Liu has been hired through the Hanban teacher exchange program. It may be a new location and a new principal, but those are among the few changes people will see in the Neenah Joint School District&apos;s Early Learning Center in 2014-15. Students from throughout Neenah were honored by the Neenah Public Library as part of its recent Proces Poetry Prize contest. There&apos;s still plenty of work to be done, but progress is being made on the upgrades to Rocket Stadium behind Neenah High School. It&apos;s only been six years since Taft Elementary housed students from kindergarten through fifth grade, however, that seems like a distant memory with the preparations for welcoming back all six grades this fall. Neenah elementary-age students learned science, technology, engineering and manufacturing (STEM) skills during the summer months through a unique summer academy July 14-18 at Neenah High School. One of the first things Neenah students will notice when they see the 2014-15 school calendar is that some of their weekends just got a little bit longer. Math teachers from around the state are spending time in the classrooms of Neenah High School this summer as part of the Wisconsin Statewide Mathematics Initiative. Another banner athletics season with nine Fox Valley Association championships and six teams qualifying for state tournaments helped Neenah place fifth in the large schools division of the Wisconsin Sports Network Cup, which recognizes the state?s top overall athletic programs. Join the Neenah Quarterback Club in its efforts to renovate Rocket Stadium at the second annual Nick Dohr Golf Outing on Sat., August 9. Students in the Neenah Joint School District will get even more hands-on technology use when they return to school in 2014-15 with the District&apos;s new Digital Technology Plan. Neenah High School graduates earned a total of $76,000 in scholarships from the Neenah Joint School District Scholarship Fund through Oshkosh Area Community Foundation. A local not-for-profit company has benefitted from the work of a Neenah High School marketing class for a recent marketing campaign. The Neenah High School Rocket Stadium project has been designated as one of the beneficiaries for the 12th annual, City of Neenah, Mayor&apos;s Golf Outing. Neenah High School&apos;s varsity boys golf team not only had a successful season with a ninth place finish at the WIAA state tournament, but all five members of the squad were named to the Academic All-State team. Neenah High School had four first place finishes as all 10 students who participated at the Special Olympics State Games in Stevens Point on June 6-7 finished among the top four in their respective events. Check out the June issue of the Connections community and staff newsletter. Selected students from Lakeview Elementary School are participating in a unique reading program to maintain reading skills over the summer months. For the fourth straight year, Neenah&apos;s girls 3200-meter relay captured the state championship at the WIAA state track and field meet on June 6 in La Crosse. Nathan Cho and Nicole Hurley have been selected as senior class speakers for the Neenah High School graduation ceremony on June 5. Check out the May issue of the Connections community and staff newsletter. Neenah High School senior Thomas Hameister has been named the recipient of the prestigious Van Vleck scholarship from the University of Wisconsin-Madison mathematics department. A 15-year teaching veteran at various elementary levels, Melissa Chrisman has been named the new principal at Neenah&apos;s Roosevelt Elementary School and Alliance Charter Elementary. Alliance Charter Elementary will celebrate the completion of its 10th year with an anniversary celebration on May 30 from 4-7 p.m.
Over 90 local youths are registered to participate in a Hershey&apos;s Track and Field meet on Sunday, May 18 that has been organized by two Neenah High School seniors as part of the school&apos;s Key Club. Lakeview Elementary fifth grade students Alicia Zhang and Rachel Strandberg had the opportunity to present a science instruction to students and teachers as part of a ?Student Centered Science Symposium? on May 9 in Oshkosh. Neenah&apos;s top fifth grade spellers competed in the 51st annual city spelling bee on Friday. Neenah High School?s Finance Bowl team of Nathan Mulder, Jenna Butts, Trevor Nelson and Evan Thomsen placed second at the state competition in Milwaukee on April 30. The Neenah Joint School District will host an Engineering Exploration summer program for students presently in kindergarten through fifth grade. Neenah High School senior Sarah Olson will have her artwork on display at the U.S. Capitol in Washington, D.C. after winning the Wisconsin 6th Congressional District Art Show in Fond du Lac. Eight individuals have been recognized as the Neenah Joint School District&apos;s Employees of the Year for the 2013-14 school year. The high school team had 12 students qualify for the Wisconsin High School Forensics Association meet in Madison on April 12 and all 12 brought home medals with top three finishes, including three first place performances. Check out the April issue of the Connections staff and community newsletter. Staff members from Neenah High School&apos;s school newspaper, the Satellite, received several awards at the recent Northeastern Wisconsin Scholastic Press Association (NEWSPA) Spring Conference in Oshkosh. Students submit writing, photographs and/or cartoons that are critiqued by professionals working in the field of Journalism, which are then ranked in the state. Students and staff at Neenah&apos;s Shattuck and Horace Mann Middle Schools have been working together to help a local girl with a craniofacial anomaly. A Neenah High School student will have the opportunity to spend three weeks this summer among the world?s brightest students as a participant in the Yale University Global Scholars Program. The Neenah Joint School District is seeking individuals to serve on the inaugural selection committee and Board of Directors for its newly formed Hall of Fame. The Hall of Fame was approved by the Board of Education at its March 4, 2014 meeting and the first class will be inducted during Homecoming weekend in 2015. NHS Rocket Players will present their annual spring drama production with four shows of the Pulitzer Prize winning play, &apos;Look Homeward, Angel&apos; on April 10-13 in Pickard Auditorium. Check out the video celebrating Neenah&apos;s Spirit of Excellence Award. For the second straight year, Neenah captured the Wisconsin high school chess championship. Taft Elementary School will have a familiar face in charge when it transitions to a kindergarten through fifth grade school this fall as Phil Johnson has been named the school&apos;s new principal.